Discussion in 'Stock 2002 - 2005 Explorers' started by bigskinsfan, April 11, 2015. Need some help. I have an 05 Explorer 4x4 (4.0 6 cylinder) with the 5R55S transmission. Backed it out of the driveway and put it in Drive. The car wouldn't, or would barely, move. Thought it was the fluid level. Pulled the center plug and a significant amount of fluid poured out. I'm guessing that the torque converter imploded. The car still goes in reverse but not forward. Outside of rebuilding the transmission, is there anything I should look at that could be the issue? Pulled the pan and the magnet was covered in shavings. No large particles but a lot of fines. Fluid was somewhat brown. I've watch numerous videos on rebuilding the transmission. Appears fairly straight forward. One thing that I could use help with is a step by step on how to remove the transmission from the Explorer. Does anyone know where I can find removal instructions or videos? That would help a lot. I dont know that theres a video, But I've pulled a few of these now, Its late so I may miss something but I'll try to give ya a rundown. Grab a can or two of PB blaster, You'll need it. Disconnect battery, Get both ends of the truck in the air. You'll need the room. A transmission jack is recommended, But I used a big floor jack. (You may want a trans jack and a regular floor jack) Spray down all of the following bolts with the PB blaster --- 2 Studs on each exhaust manifold to Y-pipe flange, Joint behind rear cat to rear exhaust section, Crossmember bolts that you can get to, Transmission mount bolts, Bolts on heat shields that bolt to crossmember. Remove front and rear driveshafts, disconnect shifter cable from lever on the side of the trans, unplug oxygen sensors, Disconnect electrical plug from transfer case, unplug all the sensors on the trans,( I have one out with the harness still attached if you'd like a pic to show all the sensors locations) On the top, passenger side of the transmission, there will be a bolt for the fuel line bracket. Up top, (and you can do this step before you put the truck in the air) The top two bell housing bolts are easier to get at with a wrench, as well as another fuel line bracket on the passenger top bell housing bolt. The other 4 should be fairly easy from the bottom, a swivel adapter may help. Leave those 4 for last. Put the regular floor jack behind the crossmember from the passenger side, or pointing straight back, and just jack it up enough to take the weight off of the crossmember when you loosen the trans mount. Remove the mount bolts either from the transmission or from the crossmember, one of mine was seized to the crossmember so I took the mount loose from the trans, Either way will be fine. On the passenger side of the crossmember, theres a plastic shield on the back to protect the fuel filter with 2 small bolts/nuts, remove the cover to get access to a hidden crossmember bolt. Theres a few bolts on the heat shields that go to the crossmember, Then 8 bolts holding the crossmember to the frame. They are known to be corroded and break. I broke 5 on my donor truck, and thankfully none on my good truck. Lay the crossmember out of the way and remove the 2 bolts at the flange behind the rear catalytic converter, Then head to the front, and remove the 2 nuts on each exhaust manifold flange on each side. Be ready to catch your entire Y-pipe assembly. Disconnect the cooler lines from the passenger side. You should now be ready for your transmission jack ( or second floor jack) slow and patience is the key, this trans and transfer case assembly is big and heavy. Double check for any other bolts or wires, etc. Position your jack/s and hopefully chain or strap the trans to the main jack. Once secured, remove the last 4 bell housing bolts. Work the transmission back and over the front frame brace, With 2 jacks or with an actual transmission jack, you may not even have to worry about the front brace. Back and down and you should be good. If you couldnt get the truck high enough, You may have to set the transmission off of the jacks and drag it out... which, like I said, Its big and heavy. Bigger than I expected for a midsize V6 truck. If you're doing the rebuild, Next step will be removing the transfer case from the trans. Or you could have chosen to do that early on after removing the driveshafts. Which ever way you choose is ok. 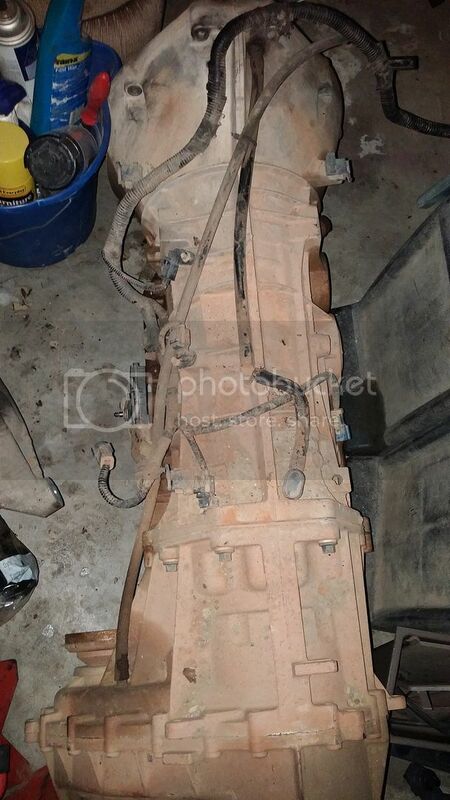 I removed mine as a complete unit as the trans was bad, and it was an All Wheel Drive transfer case thats condition was unknown, and Im converting to 4WD Like what my and your Explorer has. If anything is unclear or you have questions, feel free to ask. I usually dont make it on here till late at night but will do my best to answer what I can. Do you think I'm on the right track with regards to the Explorer not moving forward? My gut is that it's the torque converter. No chunks in the pan but plenty of shavings. Any pictures you have that you could send over would be appreciated as well. My last one from the Mountaineer lost all forward but still had strong reverse, I havent tore it down yet to see what happened because Ive been so busy with putting the new engine and trans in, and fixing my other recently aquired Explorer, I would say something is probably broke enough to warrant tear down/rebuild/replacement. I did go grab a couple pics, but keep in mind, the one pictured was an AWD transfer case, and Im converting to 4WD from an Explorer. The wiring and sensor locations should be identical except you will have a plug on the drivers side rear of the transfer case as well. Its a seperate harness and goes over above the fuel tank. 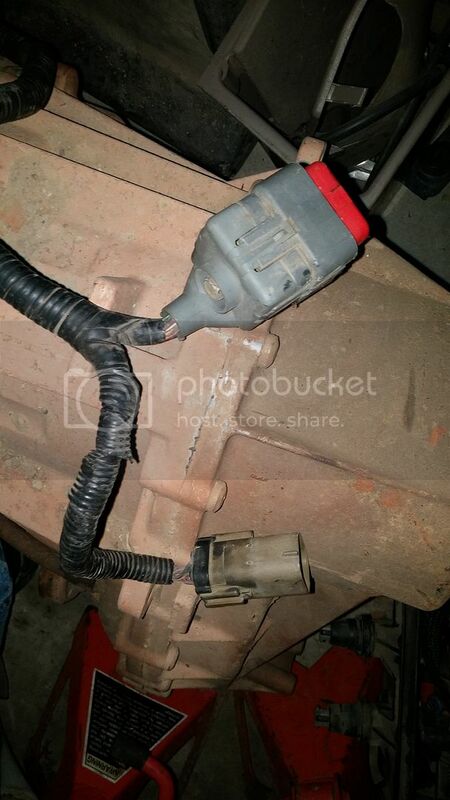 The rest of the harness all goes up to 2 plugs (also pictured) on the passenger side of your engine bay. I left the harness attached to the trans since I changed my whole layout. You could probably do the same thing to easy removal and not miss a plug somewhere, up to you. The 2 plugs than run up into the passenger side of the engine bay, one goes to the ecm , the other just goes to another plug clipped to the fender well. Were you able to tear down the trans from the Mountaineer? If so, what did you find was the issue? Also, where does the overflow tube from the transfer case go? My trans ended up with a broken servo. I installed a shift correction kit, new frictions, new bands, torque converter, and numerous other parts.